CUMBERLAND, Md. (AP) — Artist Tim Revels recalled the moment when, after he earned second place in a citywide Halloween-themed art contest, his elementary school art teacher took him aside. The soft-spoken Revels recounts his time growing up in the Baltimore city neighborhood of Canton. “I got into a lot of trouble as a juvenile,” he said. Revels dabbled in drugs as a teenager and eventually became addicted to heroin and prescription medications. A turning point came after his arrest on drug charges in 2000. As he sat in a police cruiser, the pastor of the church he attended approached the car and spoke to him through the window. “God still loves you,” the pastor said. Revels said that although he attended church regularly, until that time he really didn’t understand the meaning of forgiveness or salvation. After his arrest, Revels struggled to stay sober. Although he attended church regularly, he found himself backsliding spiritually and succumbing to the “chemical strongholds” that plagued him. In 2007, after moving to Cumberland with his wife, Deborah, daughter, Kearsten, and two stepsons, Tony and Richard Watson, Revels was arrested a second time, which led to a six-year prison sentence at Eastern Correctional Institute on Maryland’s Eastern Shore. At ECI, Revels went through a six-month drug rehabilitation program. He completed his service work at the Catoctin Youth Summit and found speaking to young people about his struggles to be a healing and rewarding experience. “I told them, ‘You don’t have to try everything, you don’t have to learn the hard way,’ ” he said. Revels became a math tutor, completed a Bible college associate’s degree program and became a church deacon while at ECI. “I learned what it was to serve,” he said. During that time, Revels turned to his artwork as a kind of therapy. “It was like meditation for me,” he said. He began producing sketches and greeting cards for other inmates and studied graphic design. Upon his release in 2013, Revels came home to Cumberland and one day found a flyer on his front door announcing a fall festival at Calvary Chapel on Pennsylvania Avenue. Revels and his family had visited a few churches but hadn’t found a church home. After attending the festival, he and his family were invited back to the church and have been regular attendees ever since. Revels became involved in decorating and remodeling projects at the church, building the platform, installing laminate flooring and painting murals in the nursery and children’s classrooms. For last year’s fall festival, Revels designed and painted an elaborate castle with individual booths inside for the festival’s “armor of God” theme. 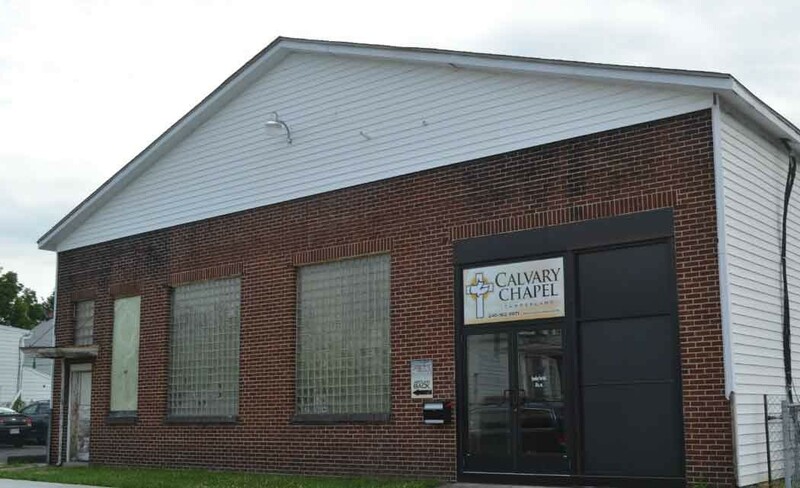 He also set up a studio in an outbuilding behind Calvary Chapel in Cumberland. “Pastor Rob really believes in me and is helping out a lot,” Revels said, referring to Calvary Chapel pastor Rob Mahovich. The new workspace allows Revels freedom to pursue his artwork, which he hopes to develop into a full-time business. A self-described realist, Revels said he does his best portrait work using reference photos. His self-penned idea book shows off his versatility and is filled with plans and designs for everything from automotive graphics to airbrush techniques. His short-term goals include a portable airbrush booth that features custom hats, shirts and other apparel. A graphic designer, Revels also creates brochures, pamphlets, flyers, banners and other custom print jobs. His future goals include an automotive airbrush booth. As he comes full-circle from the Halloween art contest he entered as a child to making a fall festival a reality, Revels is excited about the possibilities that lie ahead. “I realized God was going to give me another chance,” he said and smiled.